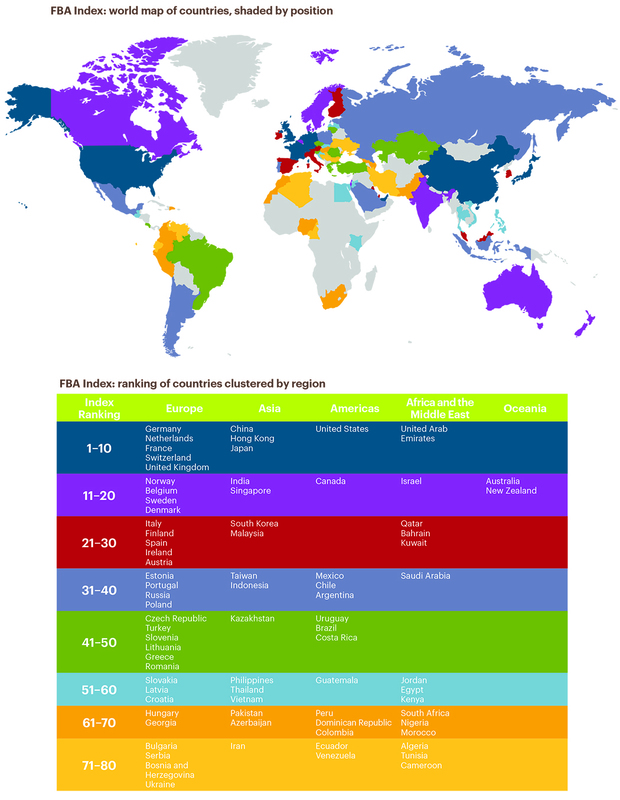 Stability prevails atop the latest Food and Beverage Attractiveness (FBA) ranking. 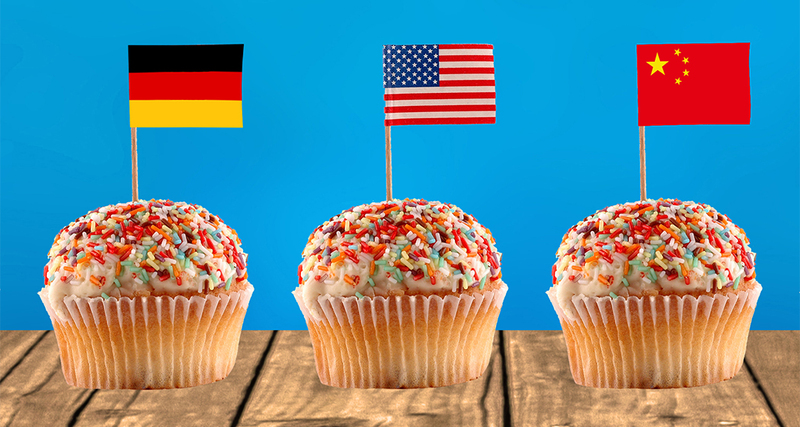 For the third year in a row, the United States, China and Germany keep their positions on the winners' podium as the three most attractive export destinations for food and beverages. Expanding our view to the top 10, there are a total of five countries that repeat their positions of last year, while none of the 10 have moved up or down more than two notches. This is according to the sixth edition of the Vademecum on Food and Beverage Markets, a co-production by IESE and Deloitte, which is meant to be a practical guide for companies in the context of IESE's 23rd annual Food and Beverage Industry Meeting. The study, led by IESE's Adrian Caldart and Júlia Gifra, analyzes a total of 80 countries, rating them based on 10 indicators that are meant to sum up their attractiveness as export destinations and investment opportunities based on the countries' economic and legal frameworks, the structure of their populations, and the situation of their food and beverage sectors. Although the United States leads the ranking, Europe continues to be the most attractive region for the food industry. Five of the top 10 and nine of the top 20 countries are European. European nations score especially high for the soundness of their economic and legal frameworks, as well as their citizens' disposable incomes and per capita spending on food. The most attractive European markets are Germany (3), the Netherlands (4), France (6), Switzerland (9) and the United Kingdom (10), which has dropped five places in two years. The uncertainty surrounding Brexit, coupled with slowing growth, is weighing down on the United Kingdom's standing in the ranking. And the worst could be yet to come if tariffs with EU trading partners are restored. The report highlights that 58 percent of UK food and beverage exports and 61 percent of its imports have their destination or origin in Europe. Major British supermarket chains and local subsidiaries of the likes of McDonald's and KFC have already warned about the risks of sharp price rises and even food shortages if a no-deal Brexit comes to pass. Following Europe, the second most attractive region is Asia, propelled by China (2), the globe's most populous country and the second largest importer of food and beverages. Other top Asian performers are Hong Kong (5), with the highest per capita spending on food; and Japan (7), which continues to be a compelling market despite having retreated three positions in two years. India (14) and Singapore (19) round out the top five list within this region noted for its enormous potential, not only from a demographic point of view but also from that of economic growth and a surging middle class, especially in India. In fact, over the past couple of years, most Asian countries have improved their positions in the ranking. The most notable two-year advances include Azerbaijan (+6), Pakistan (+5), Indonesia (+5), India (+4) and Hong Kong (+4). Without a doubt, the United States remains the most attractive market for food and beverage companies, given that it is the global leader in terms of both food and beverage imports--and it occupies one of the top positions in almost all specific import categories. In terms of the rest of North America, Canada (11) continues to occupy a high and important position in terms of all three pillars of the index. Meanwhile, Mexico (33) has been dragged down one notch, mainly because of its sluggish GDP growth. In South America, Chile (37) boasts the highest ranking again this year. Meanwhile, the ascent of Argentina (38) really stands out: it advanced no less than 23 positions over the past two years. But there's no such good news for Venezuela (80), which remains down on the lowest rung of the ranking despite the size of its market. Generally speaking, countries in the Americas are notable for their local food and beverage exports, especially relevant to firms looking to invest in local produce. Latin American consumers also tend to spend a higher share of their disposable income on food and beverages than consumers in other regions. The United Arab Emirates (8) leads the regional ranking for the Middle East, climbing two positions over last year to enter the global top 10. It is followed by Israel (18) and Qatar (26), two countries that have headed in different directions recently, as Israel gained six positions while Qatar lost seven over the past two years. On the African continent, the most attractive markets are Egypt (57), Kenya (60) and South Africa (61). Over the past two years, Egypt and Kenya have advanced six and nine positions, respectively, while South Africa suffered the ranking's biggest setback, losing 10 positions. Despite its potential, most African countries have had relatively low levels of participation in the international trade of food and beverages. The 2017-2018 edition of the Vademecum on Food and Beverage Markets features some new and improved indicators on median disposable income, market and trade efficiency, export figures and more. With these changes, FBA index scores have also been recalculated for the previous two years, allowing meaningful comparisons over three years. In addition, the report now includes half-page graphic presentations ("Countries at a Glance") for all 80 countries analyzed, with tables and radar charts displaying each country's performance along 10 indicators, as compared with the performances of top-20 countries. This year's edition also presents insights from local experts in 30 countries that are deemed especially interesting. Expert commentaries focus on salient local trends from the perspectives of consumers, manufacturers and retailers, as well as untapped opportunities and specific market conditions to look out for. With these features, the report aims to help food and beverages companies looking for new markets by providing practical research. Research is a vital first step before taking the plunge into any new international venture. Within the context of the food and beverages industry, 80 countries are analyzed in terms of their attractiveness for setting up a business or directing exports there. The food and beverage attractiveness (FBA index) ranking is based on 10 indicators that cover three pillars: the national economic and legal frameworks (25 percent), the structure of their populations (30 percent), and the situation of their food and beverage sectors (45 percent). The report brings together, standardizes and assigns weightings to relevant data from reliable sources, such as the International Monetary Fund, the World Bank and the United Nations.